In the relaxed, low-key atmosphere of our boutique, we collaborate with our clients through each step in creating a unique, handmade custom engagement ring. Our pieces are constructed in Sophie's studio using timeworn hand tools, the highest quality recycled gold and antique gems. We believe deeply in environmental and social sustainability, and feel that the surest way to be ethical with our material sourcing is to reuse what's already above ground, rather than ravaging the earth for new stones and metal. Sophie favors old mine cut and old European cut diamonds, visibly hand-cut centuries ago, for ethics and aesthetics both. Beyond the benefit of being reclaimed from discarded estate jewelry, to our eye old miners are more beautiful and vivacious, with their irregular facets and warm tones, than modern mass-produced, laser-precision stones. Our sapphires and rubies are conflict-free and responsibly sourced. We also enjoy breathing new life into clients' heirloom stones by resetting them into fresh designs. Shoot us an email at ore@sophiehughes.com with questions or for more details about the process, swing by to chat, or go ahead and schedule a free consultation where we can give you our undivided attention. 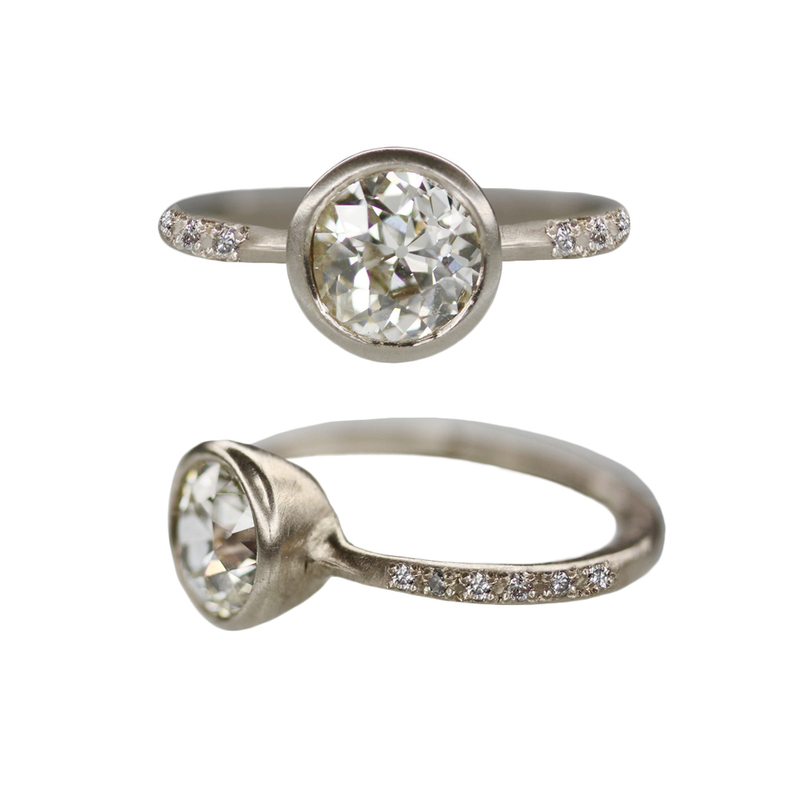 View our currently available ready-to-wear engagement rings here. 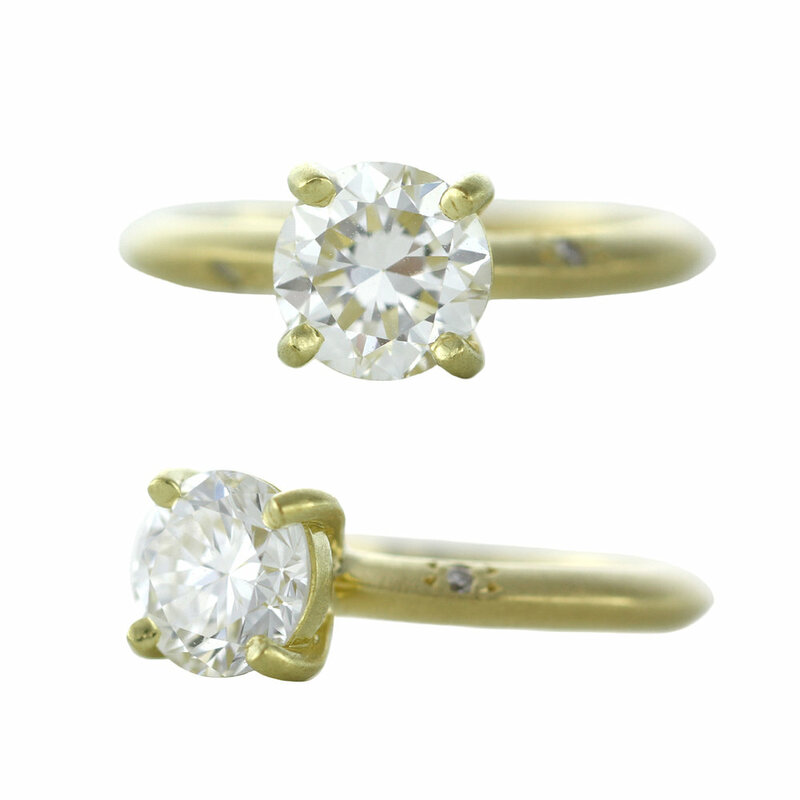 "Best Engagement Rings in Boston. This young designer forges rings from start to finish in her studio using recycled metals and reclaimed or ethically sourced gems. Choose a ready-made design or meet with Hughes to get creative. From classic shiny bands to one-of-a-kind baubles, the possibilities are endless. (She’ll even fuse metals together for a two-tone match made in heaven.) 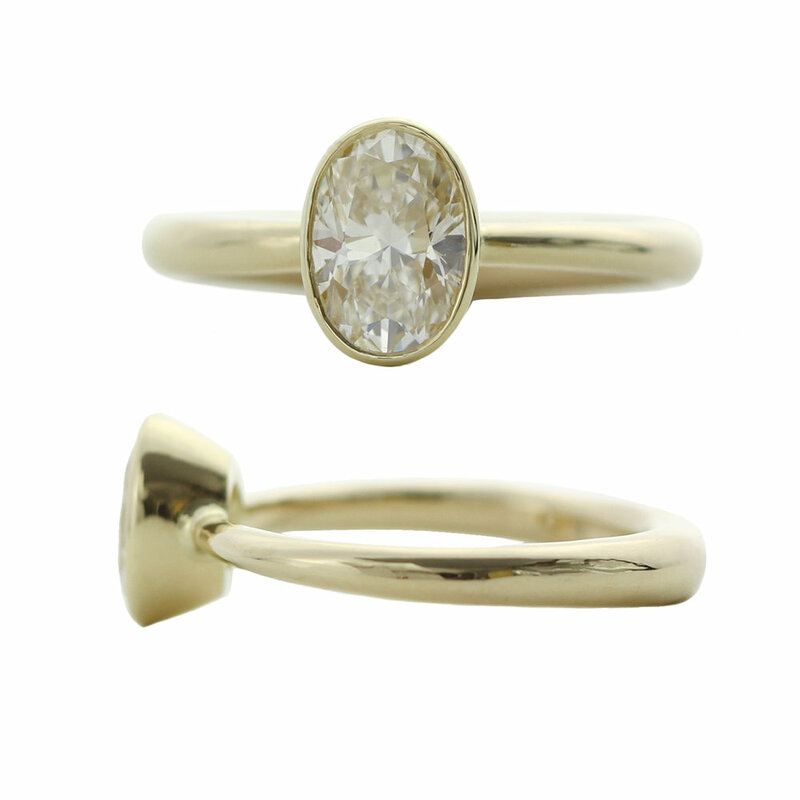 Hughes is adept with old miner stones, too, so incorporating Grandma’s diamonds won’t be a problem." "I proposed to Jackey and she said yes. She loved the ring instantly and has been praising/wearing it proudly since. We're both very happy with it and appreciate the care you took with it, as well as the timeliness of getting it done in time for this proposal. I'm especially grateful for the warmth of my experience with Ore, with each of you." 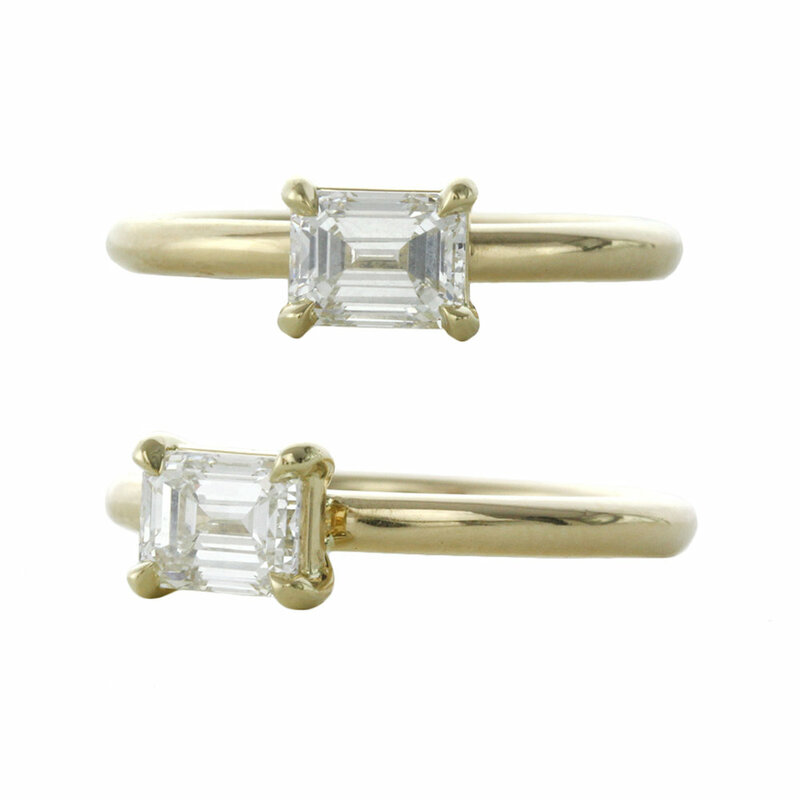 "Thank you SO much for designing such stunning rings for our engagement and wedding bands. They are exquisite - we adore them and adored working with you. You made the process so easy and special - we can't wait to work with you again soon. Thank you, thank you, thank you!" "What an incredible place! I worked with Sophie to design a custom engagement ring for my fiancee and I couldn't be happier with the results. I came in with a pretty specific budget in mind, and Sophie was able to fit all that I wanted into that budget and design a simple, modern ring that my fiancee raves about. They bring in diamonds at any price point or style you are looking for and the whole process is as stress free as it could be. I couldn't recommend Sophie more highly, and my fiancee is obsessed with the final product. Thanks again, Sophie!" "I honestly could not possibly be happier with Sophie! I was on a mission to create the perfect engagement ring for my now-fiancee, and Sophie exceeded my expectations. I basically showed Sophie a few rings that my girlfriend had pinned to her Pinterest board, gave a couple minor details to fill in the blanks (white vs. yellow gold, color/type of stone, ring size) and Sophie did the rest. She took the very small of amount of information I gave her to work with, and created literally the perfect ring from scratch. To me, this makes Sophie a true artist. She's extremely creative and willing to put in the time and effort to make something special. So, I would say that if you're looking for something unique that really speaks to someone's personality or style, Sophie is absolutely the person to go to. You won't be disappointed! Oh, and she was also just named in the Improper Bostonian and Boston Magazine as the city's best local jewelry designer. She's awesome!" "I worked directly with Sophie to design a custom engagement ring for my fiancée and could not be more pleased with the process of working with her and how the final ring turned out. I knew that my fiancée wanted a ring that was more unique and creative than your average off-the-shelf ring from Kay, and I didn't want to bust the bank on a "custom" jeweler who essentially lets you choose the components (shank, head, and stone) then hurries you out the door. I also didn't want to buy a more unique ring from an established boutique jeweler elsewhere in the country that seemed overpriced and impersonal, limiting my design interaction to phone conversations with an assistant and minimal customization at best. Sophie was recommended to me by several other local small-scale, creative jewelers who didn't have experience with precious stones for wedding rings. From the outset she was open to discussing and sketching various nontraditional design possibilities with me, rather than limiting the conversation to her previously established designs. She then proceeded methodically with providing images for conversation, producing a mockup, providing samples of a wide range of options for all components, and discussing the nuances of each decision that was made along the way. 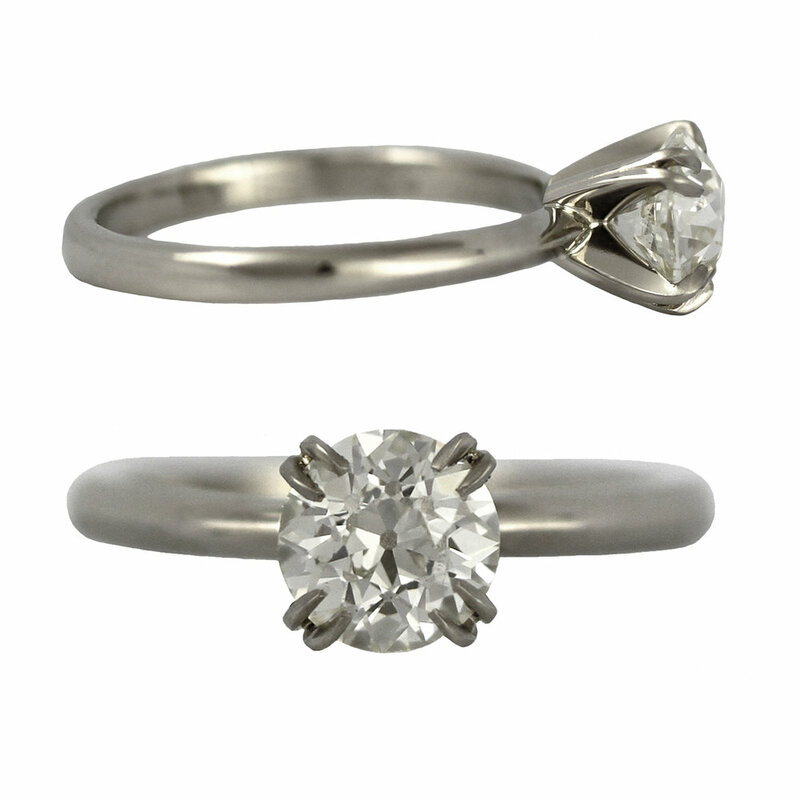 The final price tag for the ring was incredibly affordable given the level of craft and attention to detail that Sophie provided. My fiancée is ecstatic about the character and quality of the ring, and we are eagerly planning to return to Sophie to make both of our wedding bands. I cannot imagine a wedding jeweler scenario more perfectly suited to our tastes and budget, and recommend her services wholeheartedly. "